2018 was a great year for Asus as the company launched some incredible phones like the Zenfone 5Z and the Zenfone Max Pro M1. The Zenfone 5Z, when launched, became the cheapest Android device with Snapdragon 845 processor. Similarly, when the Max Pro M1 was announced, it became the cheapest phone with Snapdragon 636 processor. In India, the Rs 10K-20K price segment is the one where we see the most competition. This year, we saw some impressive phones being launched in this price segment, from the cheapest Snapdragon 660-powered Realme 2 Pro to the cheapest Kirin 970-powered Honor Play. When we talk about the best value for money phones under Rs 15K, the Asus Zenfone Max Pro M1 is undoubtedly one of the best. It packs almost everything you would like to have in a budget phone, from a powerful processor to a massive battery and stock Android. Recently, Asus revealed that in India, the company sold over a million units of the Max Pro M1. This is a huge milestone considering the fact that there is such huge competition in the sub 15K price segment. 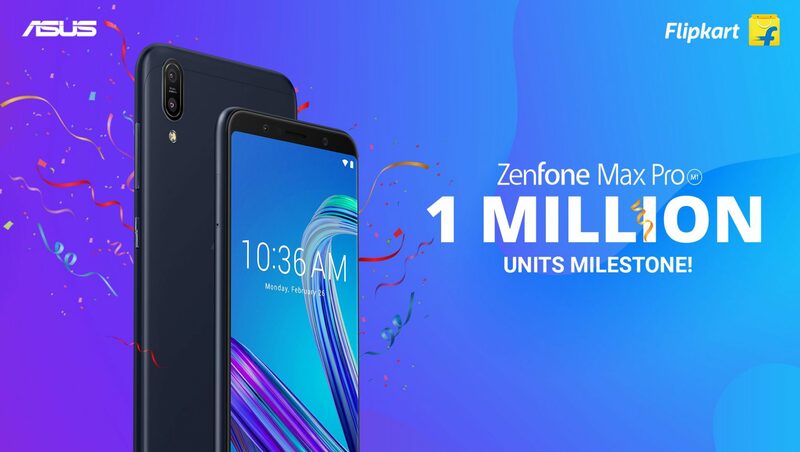 In fact, in the upcoming Flipkart’s Big Billion Days, the Zenfone Max Pro M1 is getting some tempting offers, so we are sure that it will be one of the best selling phones on that sale. If you don’t know, the Max Pro M1 starts at Rs 10,999 in India and the price goes up to Rs 14,999. The least you get is 3GB RAM, 32GB ROM, Snapdragon 636 processor, 5,000mAh battery, stock Android, 13MP + 5MP dual rear cameras and an 8MP front camera. With the highest variant, you get 6GB RAM, 64GB ROM, same processor, and battery, improved 16MP + 5MP dual rear cameras and 16MP front camera. With the recent updates, most of the bugs and issue have been fixed. Also, the company will soon roll out an update that is going to enable EIS. So, that’s also nice news. Again, congratulations to Asus on this milestone.